PART TWO: The Game Is Afoot! Since the 1980s, the Temple Movement has been steadily working in earnest to gather and prepare the critical elements and to even train the priesthood that will serve in the new religious complex seated in Jerusalem. The importance of these efforts throughout parts of the Orthodox Jewish community and machinations of global political interests will become clearer as we reveal the Temple’s role in what rabbis believe has already started—the first stage of the messianic process (Moshiach Ben Yosef, or “Messiah from the house of Joseph”), which is described as the practical and social precursor to the second stage of the Messiah’s appearing as Moshiach Ben David (“Messiah from the house of David”) that includes reinstitution of Temple services for the third and final sanctuary under a Davidic dynasty. But, you may say, the Muslim Dome sits atop the Temple Mount over the very (ancient) spot, some believe, where Jehovah’s Holy of Holies existed, and thus a Jewish Temple cannot be built, as it would start a world war if anybody tried to remove and replace the Al Aqsa Mosque, which rests on the far southern side of the Mount, facing Mecca, and/or the Dome of the Rock that currently sits in the middle where the Jews’ Holy Temple previously stood. And yet, there are ways this substantial hurdle may soon be overcome. WATCH PART-TWO OF NEW INVESTIGATIVE SERIES! And then there is a third possibility involving how the Third Temple could be built. On June 18, 2009, it was announced in Jerusalem as a result of theological research that “a prophetic rabbi” could allow for an extension of the Temple Mount to be made, on which the third Jewish Temple could be constructed. In an article called “A New Vision for God’s Holy Mountain,” Ohr Margalit, rabbinical studies professor at Bar-Ilan University in Israel, wrote that “the scenario of a holy revelation given to an authentic prophet that the temple be rebuilt on the current or an extended Temple Mount in peaceful proximity to the Dome, Al Aqsa Mosque, and nearby Christian shrines” is all it would take to approve such a plan. As alluded in the bullet points in PART ONE of this series, due to the occult value or sacredness of the numerous elements surrounding Freemason versions of Solomon’s Temple (on which all Masonic lodges and ceremonial rituals are based), there has been an idea for some time that groups from among the Freemasons and illuminated fraternities intend to rebuild or to participate in the rebuilding of a glorious new Temple in Jerusalem fashioned after the one built by Solomon. Disclosure of this has occasionally reached the public’s ear. The Illustrated London News, August 28, 1909, ran a spectacular supplement detailing this goal. The article was titled, “The Freemason’s Plan to Rebuild Solomon’s Temple at Jerusalem.” Three years later, September 22, 1912, the New York Times published an outline by Freemasons to rebuild the Temple under the title, “Solomon’s Temple: Scheme of Freemasons and Opinions of Jews on Rebuilding.” By 1914, some publishers had begun adding unprecedented details, including a report that the land on which the Dome of the Rock now stands was secretly purchased and plans were already under design for the construction of the third and final Temple. Researchers since have produced intelligence that a hushed collaboration is firmly in place, held back only against the right time, opportunity, and circumstances when exalted Freemasons and their associates will move with haste to reconstruct a new Temple, and then their messiah will pass through the golden Masonic portals of the Temple, announcing to the world that the universal savior of mankind has come (Apollo incarnate to them). 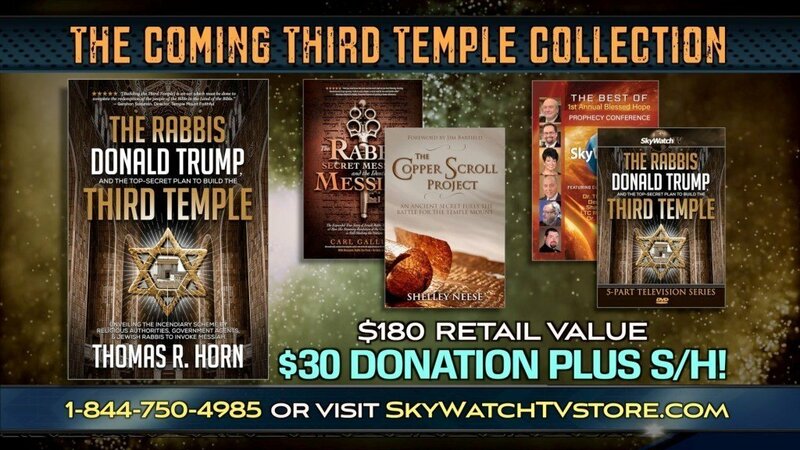 In addition to occultists, devout groups including the Temple Mount Faithful and the Temple Institute in Jerusalem are busy restoring and constructing the sacred vessels and vestments that will be used for service in the new Temple at the arrival of Messiah (see http://www.templeinstitute.org). While not all Evangelicals agree, some dispensationalist students of prophecy recognize the importance of such plans as signaling the coming of Antichrist and view Old and New Testament Scriptures as explaining that a false Jewish messiah will appear, enthroning himself as God in the Temple in Jerusalem, but afterward, he will defile the holy place by setting up a sacrilegious object—perhaps an image of himself—in the Temple and ordering the sacrifices and offerings to cease (see Daniel 9:27; 2 Thessalonians 2:3–4). For any of this to occur, it is necessary for the Temple to be rebuilt, thus making claims by Freemasons or other groups interested in fulfilling this monumental task interesting in light of unfolding end-times events. [i] Zafrir Rinat, “Earthquakes in Israel: Tenth Tremor in a Week Shakes North,” Haaretz, July 8, 2018, https://www.haaretz.com/israel-news/.premium-earthquakes-in-israel-tenth-tremor-in-a-week-shakes-north-1.6248542. [ii] Jason Keyser, “Jerusalem’s Old City at Risk in Earthquake,” Associated Press, updated January 19, 2004, http://www.msnbc.msn.com/id/3980139/. [iii] Khaled Abu Toameh, “Abba’s Fatah: Israel Planning to Destroy Al-Aqsa Mosque,” Jerusalem Post, July 26, 2018, https://www.jpost.com/Israel-News/Abbass-Fatah-Israel-planning-to-destroy-Al-Aqsa-Mosque-563525. [iv] Ohr Margalit, “A New Vision for God’s Holy Mountain,” http://newsweek.washingtonpost.com/onfaith/guestvoices/2009/06/a_new_vision_for_gods_holy_mountain.html.